Armco Car Park Barriers are the most common type of barrier and you have probably seem them along the centre of Roads and Motorways. 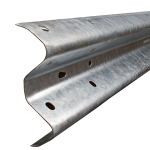 Versatile in use, they are 310mm wide with 85mm corrugations and are generally available as a 3.2 metre effective length ,achieved from a 3.5M overall beam or 1.6m from a 1.9m overall beam both have a 300mm overlap at each end and are jointed with 8 no bolts. We can supply “make up” beams cut to exact size for your required run length or we can fabricate specials to suit any situation. Curved beams are available to accommodate the contours of your site, but a curve of 50m can be achieved with standard car park barriers.. Car Park Barriers are holed 8 times at each end for M16 bolts, the holes are slightly elongated to allow for easy jointing. They are joined together by overlapping the ends and securing with 6no bolts. If there is a direction of traffic flow at the location where they are installed (such as at the side of a drive way or ramp) then the car park barriers should be overlapped in the same direction. What this means is that the overlapped raised edge is facing away from the oncoming traffic. There are slots in the beams in the centre of the valley to allow for fixing to posts with a single M16 bolt for each post. The slots allow for the posts to be set at 3.2m or 1.6m centre to centre as standard, although they are easily drilled on site to accommodate extra posts, or where posts need to be set at a different centre to over come a particular problem.